Starting out with John Carpenter’s 1978 cult hit, “Halloween,” this is how the world first met Michael Myers, the unstoppable killing machine that carried the franchise. As a little boy he kills his sister on Halloween night, and is subsequently sent to a mental hospital where he is locked away for life. However, on another Halloween night, he manages to escape, no a full-grown adult, but no less insane—and more dangerous than ever. Once at large, Michael begins another killing spree and Dr. Sam Loomis (Donald Pleasance) is in hot pursuit, desperately trying to put a stop to Michael’s killing spree. “Halloween” has seen a remarkable number of incarnations home video, both on DVD and Blu-Ray, also recently celebrating the film’s 35th Anniversary. As part of the collection, you will find a pristine new transfer of the film, offering up both the theatrical cut as well as the television cut of the film. Stacked with bonus materials and a new commentary track, this disc is the anchor of the entire set. “Halloween II” picks up seamlessly where the first film left off, with Laurie Strode (Jamie Lee Curtis) being taken to the hospital while Michael Myers disappears. He surfaces shortly after at the hospital to complete his unfinished business and stalks the corridors of Haddonfield Memorial, brutally slaying everyone in his path. Also offering the theatrical and the television cut of the film, the presentation of the movie is also pristine, without blemishes or defects. Sadly, the film does not have any subtitles/captions, nor does it contain a chapter stop menu. It does, however, contain a good number of bonus materials that shed light on the film, the production and everything else surrounding this movie. “Halloween III” is the outlier in the franchise—always has been—because this movie does not feature or center around Michael Myers. Instead, it is a story capturing the same tone in essence, but surrounding strange events in which people are brutally killed and mutilated, leading up to Halloween night. The movie is much-maligned—undeservedly so, I feel, because once you get past the fact that it’s not a Michael Myers vehicle, it is actually a pretty cool and atmospheric 80s horror flick. “Halloween III” also comes without subtitles or chapter menu, but offers up a host of bonus materials once again, certainly making fans of the film happy. “Halloween 4” and “Halloween 5” are clear fan-favorites in the franchise and it is great to see that they are presented in this set in glorious incarnations. 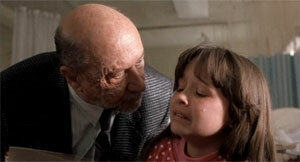 They mark the appearance of Michael Myers’ niece, played spectacularly well by a young Danielle Harris, giving the films a renewed push as viewers fever for the well-being of the little girl, wile also being impressed by her resourcefulness. In essence, these are the same discs that Anchor Bay released individually a while back, but that’s no detriment at all. The movies are presented in pristine transfers with great audio tracks and a host of bonus materials that take you behind the scenes of the film with numerous commentary tracks and featurettes. The franchise took a bit of a nose-dive with “Halloween: The Curse of Michael Myers,” a film that simply did not live up to fan expectations. With little new to offer, the script felt stale and repetitive at this point, the characters felt bored, and for some reason, the story just never really got into full gear. Still, for fans of the film, it is great to have the movie in this collection, especially because it is presented in both its theatrical cut and the extended Producer’s Cut or the first time. Because “Halloween: The Curse of Michael Myers” has not seen as many previous releases as the other films, there are a slew of brand new bonus features on this release that will make any fan of the franchise rejoice. Look for a new commentary track as well as interviews and featurettes covering an enormous breath. From casting to locations to production and writing, to working with the actors, the creation of the score, everything is there, even a selection of deleted and alternate scenes. After a bit of a break in the franchise as a result of the lackluster boxoffice performance of “The Curse of Michael Myers”, “Halloween” returned in 1998 with “Halloween: H2O” and to the delight of fans around the globe, Jamie Lee Curtis returned to her part as Laurie Strode. It was a major step because the actress had long distanced herself from the horror films and scream queen image of her early career. 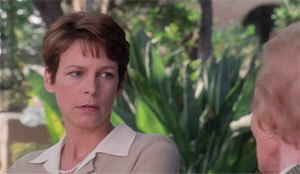 In this film, she plays Laurie as the headmistress of a private school, when Michael Myers reappears. Instantly he wreaks bloody havoc among the students, once again leaving a bloody trail. “Halloween: H2O” has a decidedly different tone that the previous films, falling squarely in line with the horror films of the time, such as “Scream” and “I Know What You Did Last Summer” in terms of its writing, casting and acting. The film looks beautiful on the disc, which also serves up a number of bonus materials, including a new commentary track and a new featurette. The most notable thing about both is that Jamie Lee Curtis participated in both of them. The success of “H2O” quickly spawned a sequel called “Halloween: Resurrection.” The movie is a dismal failure and without a doubt the franchise’s weakest film. Featuring another glamorous cast that is nothing more than an assortment of pretty faces, the film has barely a story and offers barely a hint of actual acting. Jamie Lee Curtis is prominently shown on the cover but her part in the film is minuscule at best, serving really just as a teaser to get people to buy movie tickets. 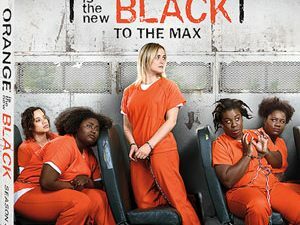 The film offers a top-notch transfer, however, that is rich in color and bold in its blacks, and the disc contains a good number of bonus materials, such as deleted scenes, commentary track and featurettes. These features, while plenty, are not new and in essence the disc is identical to the previous Blu-Ray release of the film. And with such an atrocity of a movie being the last straw, the “Halloween” franchise was essentially killed off, until in 2007 Rob Zombie decided to give Michael Myers another shot. With a completely new approach, a new look, a much grittier story and an incredible touch, Zombie remade “Halloween,” telling the beginning of the story once again. With powerful visuals, incredibly suspenseful story and a Michael Myers that was more evil than all his previous incarnations combined, Rob Zombie gave the “Halloween” franchise a much-needed shot in the arm, showing that it is possible to bring new life to an old franchise if you just go beyond the usual template, if you avoid the built-in stereotypes of the franchise, if you dare to break with convention and try something new. 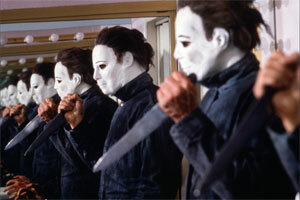 The movie was a tremendous success and ranks with John Carpenter’s original as the best film in the entire franchise. With a meticulously clean transfer and tons of bonus materials, including bloopers, featuettes, deleted scenes and a feature-length documentary that comes on a separate disc, the disc is identical in content to the previously released Collector’s Edition, featuring the film’s Director’s Cut. 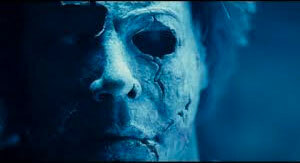 Which brings us to “Halloween II,” the last film in the “Halloween” series, also directed by Rob Zombie. Like in the original movies, “Halloween II” picks up at the exact moment that the previous film leaves off, as we follow the aftermath of Michael Myers’ rampage. Perhaps a bit too self-conscious from the success of “Halloween,” Rob Zombie never manages to conjure up the same brilliance here as he did before, and ultimately the film once again begins to feel like a stale sequel rather than an exciting new venture into the dark abyss of Michael Myers’ mind. Consequently, the film is never as effective and has trouble keeping viewers engrossed. Featuring the Unrated Cut of the film, the disc also contains a number of bonus materials, such as a commentary track, deleted scenes, featurettes and behind-the-scenes footage. The box set contains a full-color booklet with liner notes by Michael Gingold and countless photographs. You simply can’t go wrong with the “Halloween Complete Collection.” Every “Halloween” movie in high definition, amped up with tons of bonus materials, some old but much of it brand spanking new! Each film comes in a sleek all-black Blu-Ray case, as opposed to the blue ones usually used, and together they make a collection that is cohesive and… well… complete. Stop cobbling together versions here and there from different releases and different studios. “The Halloween Complete Collection” puts it all in one place, and puts a ribbon around it-virtually speaking. If you are a fan of the franchise, there is absolutely no way you can say “No” to this spectacular release. Crossing studio politics and bridging the gap of fragmented licensing rights, this collection is almost a miracle in its own right and it gives us hope that perhaps in the future we will be able to witness similarly complete collections of other movie franchises.